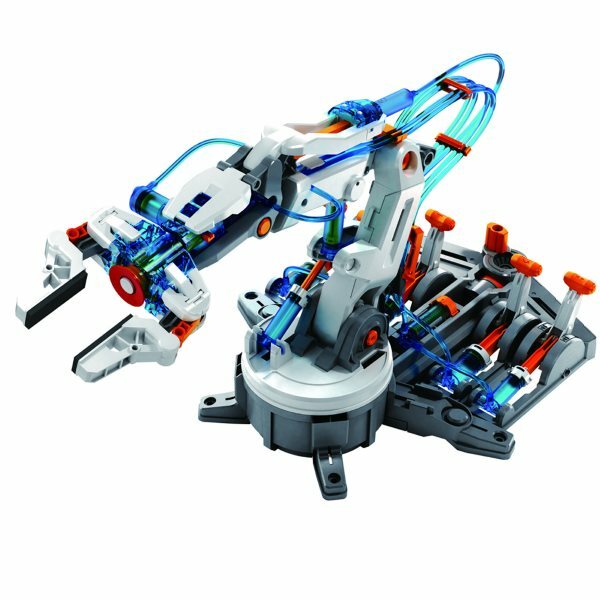 The Hydraulic Arm Edge Robotic Arm Kit uses hydraulic power to control a six axis arm and gripper without any electricity. This robotic arm kit is powered by water. No batteries, motors or electronics are required. 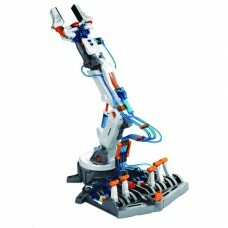 The arm is controlled using a set of levers that manipulate six axis of motion. The completed robot arm kit has a vertical reach of about 16 inches and a horizontal reach of about 12 inches. The base rotates up to 270 degrees, the shoulder moves 45 degrees, the elbow bends 44 degrees, the wrist bends 98 degrees and the gripper hand rotates 180 degrees. The gripper can open almost 2 inches wide. The arm can lift an object that weighs up to 50 grams. The gripper can be removed to activate a suction apparatus. Kids love to pick up and manipulate objects with this robotic arm while learning about science and engineering. 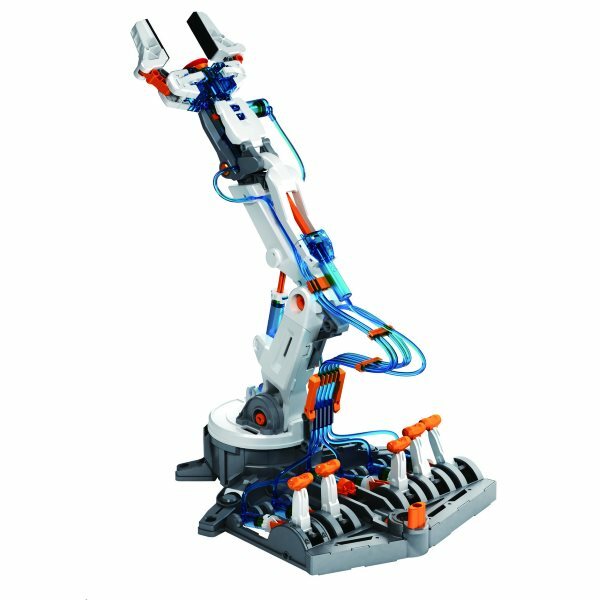 It is a toy that will inspire your children to think about the mechanical aspects of the robots that will share their future. We've seen children spend hours playing with robotic arms. The Hydraulic Arm Edge is a kit that requires assembly. The instructions are easy to follow with detailed illustrations. Though recommended for ages 10 and up, we recommend that adults supervise the construction as it can be challenging.